Bib�l p�r f�mij� me ilustrime t� nj� stili t� ve�ant�, mjaft t�rheq�s. P�rfshin historit� kryesore nga Zanafilla deri tek Zbulesa, gjithsej 56 histori, 28 nga Dhiata e vjet�r dhe po aq nga Dhiata e re. Synon f�mij�t e moshave t� vogla n�n 12 vje�. M�nyra e tregimit t� historive �sht� e till� q� e lidhur me ilustrimet, e sjell shum� bukur Fjal�n e Zotit te f�mij�t. Nga The Interconfessional Bible Society of Albania (Shoq�ria Biblike Nd�rkonfesionale e Shqip�ris�), 115 faqe, botuar ne shqip nga The Interconfessional Bible Society of Albania (Shoq�ria Biblike Nd�rkonfesionale e Shqip�ris�) ? 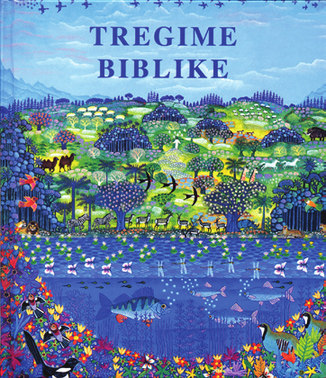 It�s a Bible story book for children with a special style and attractive illustrations. It includes the main stories from Genesis through Revelations, all together 56 stories, 28 from the Old Testament and 28 from the New Testament. It was written for children under 12 years old. The way of telling the stories with the illustrations is an excellent way to introduce the Word of God to children.